NOT RUSTY! 84 Cadillac, Fleetwood Brougham D'Elegance, WINTERIZED! A-1 Shape, " Air Cared" STATS AVAILABLE FROM OWNER. 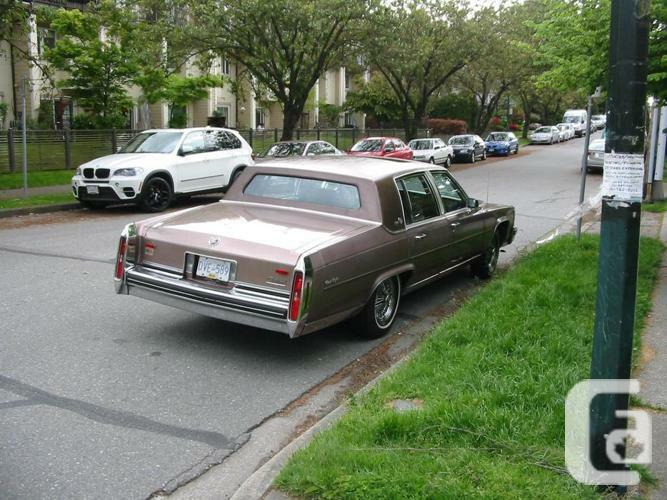 Classic(Kilometres 189,000 km, OR Total 119,000 Miles, Newer Small Block V8- 4.1 L, Cheap On Gas, Sun-roof (Tinted) Glass, 4 Door, Rwd, Rose Brown Ext, Velor Int.,Sunroof, Vinyl Roof, Original Spoked Wheels W/Anti Theft, Loaded, New M+S Front Tires and Like New Rear M&S Tires, Wheel Alignment-balanced , New Bcaa H/D Battery, Alternator, Prof. Rebuilt Air-Cond., Air Module(SPARE N/C), Heavy Duty Brakes New Pads & Rotors On Front, Heavy Duty Delco Air Shocks,All New Fan Belts, New Water Pump-hoses Etc, Plug In Winter, New Steering Pump, New Intermittent Windshield Wiper Module Pump & Blades, Serviced Transmission Including Fluid, (Front & Back Seals), New Oil Change For Differential, Recent Complete Tune Up Plugs, Dist'r, & New Cat. Converter,New Tail-pipe, New Starter, Oil Lube Filter Etc. Including Moly., New Gas Filter, H/D Headlights, Fog-day Lights, Special Anti-rustproofing And New Gravel Guard, Compact Spare W/ Jack, Am/Fm Tape Deck (Stereo) Front & Back Speaker System, Cb Radio N/W, Owners Manual, To Much To List, (Have All Receipts),Just Had New Oil, Lube Filter. If You Are In The Lower Mainland, You Would Know About Aircare, HAVE ALL RECEIPTS AND STATS. ASKING $12,999 Firm Call Don , By Apt Only, Daytime Viewing, BRING OWN CERTIFIED MECHANIC FOR CHECKING IF YOU PREFER. Price: $12,999 NOT RUSTY! 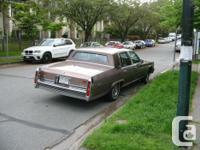 84 Cadillac, Fleetwood Brougham D'Elegance, WINTERIZED! Price: $12,999 NOT RUSTY! 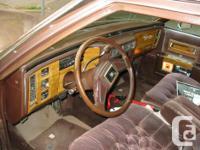 84 Cadillac, Fltw Brougham l/ miles on newer motor, WINTERIZED! Price: $12,999 NOT RUSTY!! 84 Cadillac,Brougham D'Elegance,newer s/blk 250 ci WINTERIZED!